Order Before 1pm for Next Day Delivery (Available at Checkout) - Available Monday to Friday. A quality multi-purpose topsoil, screened and blended through a 10mm screen to remove stones and lumps, this topsoil is fine and friable and easily raked and levelled for turf laying. 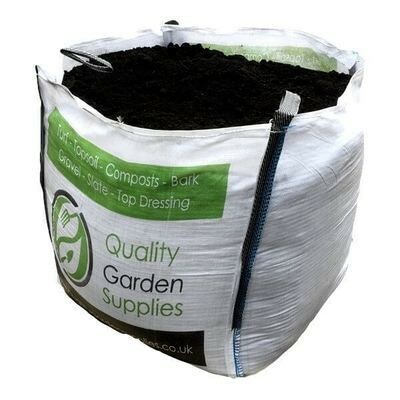 Our multi purpose topsoil is a sand loam soil which is suitable for a range of applications throughout the garden, it is an ideal topsoil for turf laying as it is easy to rake out and free draining. 1 tonne delivered in a bulk bag on a pallet. Please note this calculator is for guidance only and will round up to the nearest bulk bag. Topsoil is delivered on pallets, on curtain sided lorries with a tail lift and pallet trolley and are only guaranteed to the kerbside. Please note items may be delivered in multiple deliveries. See our delivery details page for more information on our delivery service and Terms and Conditions. Orders can be delivered next day if placed before 1pm Monday to Friday & next day delivery is selected, we can also deliver on Saturday mornings, Sat Am option must be selected in the checkout. The order cut off point is 1pm each day Monday to Friday.